Many of the projects on this web site such as simple crystal, transistor and tube radios will require a good antenna. One of the simplest yet very functional antennas is the Marconi -- often called a random wire or long wire. Determine how much stranded insulated #12 copper wire wire you will need by stepping off the distance from your house to the tree or structure onto which it will be anchored. Allow extra wire for the anchoring at each end which, if you select a tree to attach to, will depend on how high up in the tree the antenna will go. Electrical supply stores will carry this kind of wire since it is used extensively in commercial wiring systems. It comes in practically any color but I suggest white since that will cause the antenna to blend in with the sky. Two "egg" insulators are required. These can be purchased at Radio Shack. You might try amateur radio swap meets also. In the spirit of the PME (Poor Man's Electronics) theme, you can use short pieces of PVC thick wall pipe. Cut two 5 inch long pieces and drill two 1/4" holes all the way through the pipes one inch from both ends of each piece. The antenna wire passes through one end of the insulator and the anchor wire on the other. Put several layers of electrical tape over the wire wrappings to secure them. To anchor one end of the assembly to the eave or soffit of your house, use a 4 inch eye-screw. Loop the anchoring wire through the eye and then twist and wrap with tape. You will need a length of #14 stranded insulated copper wire for the lead-in. The amount you will need depends on the length from the attachment point on the house, down and through the window into your work area. I strongly suggest you install a lightning arrestor. Antennas not only attract radio signals but lightning as well. You can buy one at most hardware stores or at Radio Shack. Most of the arrestors readily available are made for twin-lead TV wire, thus it will have two antenna connection terminals. You will use only one -- doesn't matter which. The base will be screwed into the frame of your window and grounded. Scrape off and clean two inches of the #14 wire and wrap it under the screw as you tighten it down to make the ground connection. Off course, the other end will be connected to the ground wire. You'll scrape off a 1/2" strip of insulation from the side of the ground wire lead-in and solder the arrestor ground wire to it. When you bring the lead-in wire from your antenna to the window, pass it under one of the screw down antenna connections on the arrestor. They usually come with a spiked washer that will bite into the conductor through the insulation. Tightened the connection securely and cover it with caulking. You can make your own lightning arrestor if you wish. Click here. If the lead-in wire must traverse a long distance, you will need one or more stand-off insulators. These devices are sold as TV antenna twin-lead stand-off insulators. They are essentially an eye-screw with a rotatable plastic insert. You'll want enough of these stand-off insulators to make sure the lead-in wire doesn't contact the side of your house at any point. Select the places where you want the stand-offs to be mounted and screw them in. Turn the inserts so that the lead-in will pass into the eyes, then turn the inserts again to lock the lead-in wire in place. The ground wire lead can be passed through the window by simply drilling a 1/4" hole all the way through the sill and passing the wire through it. Seal around the hole with silicone caulking. To pass the lead-in from the antenna wire though the window, obtain a short length of plastic tubing (you'll need only a few inches so the local hardware will probably give you a scrap piece.) Quarter inch tubing will do fine, just make sure the lead-in wire passes easily through it. Drill a 3/8" hole all the way through the sill plate. Seal everything by surrounding clear silicone caulking around the wire in the tubing and around the tubing in the hole. For a good ground, the best is a copperweld ground rod and clamp that can be purchased at an electrical supply store. But since this in PME, you can use any piece of old pipe at least 6 foot long and drive it into the ground. Galvanized pipe is best. You can't drive copper pipe into the ground; it isn't strong enough. (Commercial ground rods are steel with a copper outer layer.) Now here is a good hint: Drive the pipe so the top is flush with the ground. Then dig out around the top of it to a six inch depth. Pound the pipe into the ground some more so that the connection can be covered back up with dirt when done. Now strip off a foot of insulation from the end of the ground lead wire. Clean the area on the pipe with emery cloth. Wrap the wire around the pipe, and then put two hose camps on it to hold the connection tightly. Coat the whole connection with clear silicone caulking. Tuck the ground wire lead a couple of inches below grade up to the edge of the house. Fill in all the holes with dirt. Now you have a ground system that is totally buried and won't interefere with lawn mowing or trimming. If you would rather dig than pound, the ground pipe can be laid horizontally in a 3 to 4 foot deep trench. In this case, you can use copper pipe. I've been told that if you want a really good ground, put copper sulfate (available at hardware stores) around the pipe before covering it up with dirt. If you are using a structure to anchor the far end, follow the instructions for the house termination described above but leave out the lead-in wire. The shock absorbing spring will go in the anchor line. If you will use a tree to anchor the far end of the antenna, then follow these instructions. First, put an egg insulator on the end of the antenna similar to the way you did it for the house end. Of course, you won't need a lead-in connection on this side. 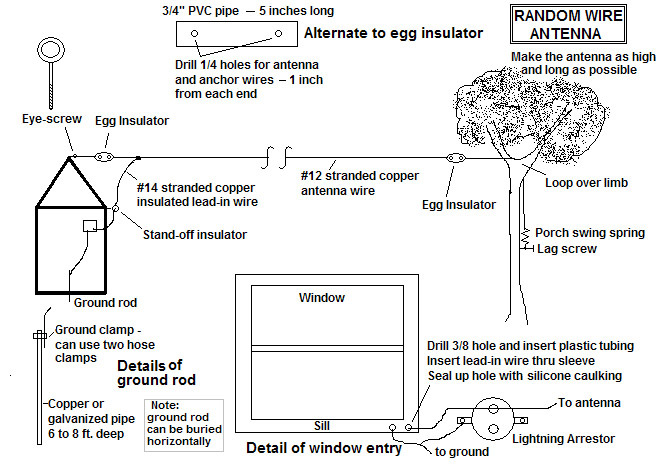 Make sure the egg insulator is placed at a point where it will not be into the leaves or branches of the tree; in other words, the main antenna wire should always be clear of any obstructions. Also make sure you have enough anchor wire to reach over a high limb in the tree and then all the way to ground. Put a weight such as a heavy fishing line sinker on the end of a roll of twine or fishing line. Toss the sinker over the limb; the highest limb for which you can successfully accomplish this task. Connect the anchor wire from the egg insulator to the twine and pull the anchor wire over the limb and down to the ground. Drive a 3/8" dia. x 6 inch long lag screw into the tree at eye level. Attach a heavy duty spring such as a porch swing spring to the lag screw. Pull the anchor wire through the remaining eye of the spring. Use some "heave ho" to raise the antenna up into the air before wrapping and taping to secure the anchoring. Don't put too much tension on the wire. Some sag is not only OK, but desirable to keep the wire from breaking under high winds and/or ice. The spring will help release some of the tension under heavy loading. If you want the antenna higher up than you can reach by throwing, then try this trick: go to a sports supply store and get a fishing arrow. A fishing arrow is made of hard plastic, has no feathers, and has a small hole into which you can tie the fishing line. It shoots like a regular arrow. It will take you several tries to get the line over the desired branch but once you have succeeded, then just follow the steps above starting at the place where the line has been successfully looped over the branch. Copyright © 2007 - Prof. W.S. Walker, West Virginia State University - All Rights Reserved.